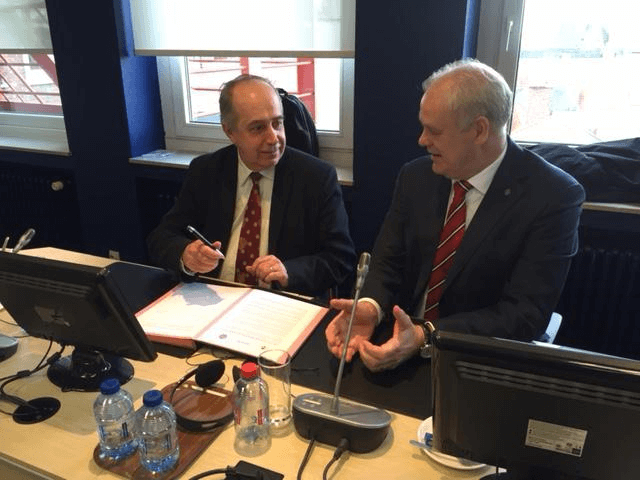 On 4 March 2015, the President of the ETF Road transport section, Roberto Parillo, and Euro Contrôle Route (ECR) general delegate Gerard Schipper signed a declaration of intent that will see both organisations working together for improved, fairly applicable, enforceable rules. By working together the organisations strive to improve standards of regulatory compliance, enhance road safety, work towards innovative ways of enforcement for both enforcement officers and transport workers through training and education. The ETF and ECR strongly believe that cooperation of main stakeholders across the road transport sector will encourage compliance and ensure a safe, sustainable and fair transport market for all, including the professional drivers. The declaration of intent and the work plan the two organisations committed to can be found under below. ETF and Euro Contrôle Route enter formal cooperation.